The TT User Setup Server (Master or Slave) frequently updates its local database with the most current data. You can monitor all server activity through a Server Messages window, which is available through the TT User Setup Client. Note: You do not need to be logged in to view server messages. You use the Server Messages window to monitor server activity including login attempts, server ups or downs, error conditions, etc,. In addition, the window shows occurrences of database replication whereby administrator changes processed by the Master server are replicated by any Slave servers running in the environment. For detailed information regarding server replication refer to the TT User Setup System Administrator Manual. Note: When logged in as a non-Super Administrator, the administrator can only view logins for users the administrator is designated to manage. From the Reports menu, select Server Messages. Note: The Server Messages window appears automatically whenever an error is received. The Server Messages window displays only messages that occur while the client is running. 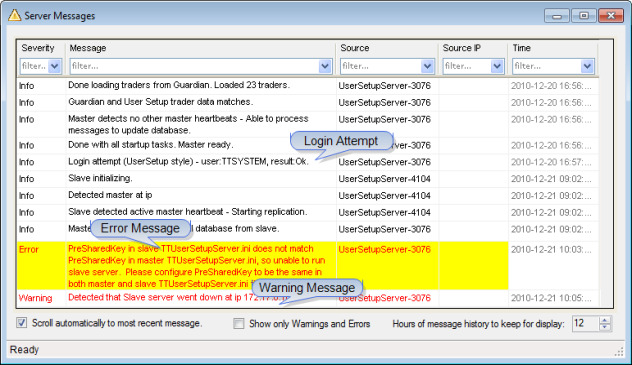 Refer to the server log files (in the ~tt/logfiles directory) for current and previous log messages. To stop the Server Messages window from scrolling automatically to the most recent message (at the bottom), uncheck the Scroll automatically to most recent message option. To display only warnings and errors, check the Show only Warnings and Errors checkbox. To configure the number of hours of messages the Server Messages window displays, set the Hours of message history to keep for display field.